Are you about to throw away those forks and spoons that somehow came to you from a grandmother? I am all in favour of decluttering, but don’t consign your old cutlery to a (hopefully, recycling) dust bin just yet! At least not until after you’ve given the whole thing some further consideration. First, examine those spoons, forks and knives carefully to see if they are hallmarked. A hallmark usually indicates that the item is made of a noble metal such as silver. However, non-precious metals such as pewter can also bear a mark. If you find the word sterling or the number 925 on a handle, you are in possession of a piece of cutlery that contains 92.5% silver and 7.5% nickel or copper. And that means it is worth something even in the form of melted metal! Silver-plated forks, spoons and knives do not have real value as far as the metal they are made of goes. They have a thin layer of silver that covers a base metal, which is usually nickel, and often have the words silver-plate, electroplate or the initials EPNS (for electroplated nickel silver). Older, well used silver-plated cutlery can show wear, especially on the ends of fork tines. On the other hand, silver-plated items can be very ornate and pretty; it can also be valuable as a collector’s item. Once you take a closer look at your old items of cutlery, you may want to use them; decorate your kitchen with them; start a collection; or sell them on bidorbuy. Here are some knives, spoons, forks, salad servers, carving sets, pickle forks, soup ladles, and melon ballers spotted in the cutlery section of the bidorbuy kitchenalia category. A few of the items pictured above date back to the early 1900s and can be considered antique, though most are from the middle of the last century and thus fall into the vintage category. Also, note that souvenir cutlery (most often spoons) can have value for collectors. And for the curious, here are some notes on terminology and history. Cutlery includes any hand implement used in preparing, serving, and especially eating food. Cutlery is more usually known as silverware or flatware in the United States of America. The origin of the knives and spoons is lost in the farthest depths of history, but the forks are a relative newcomer. A version of the fork appeared in the ancient civilisations of Egypt, China and Greece, but it was used for preparing and serving food, not for eating it. 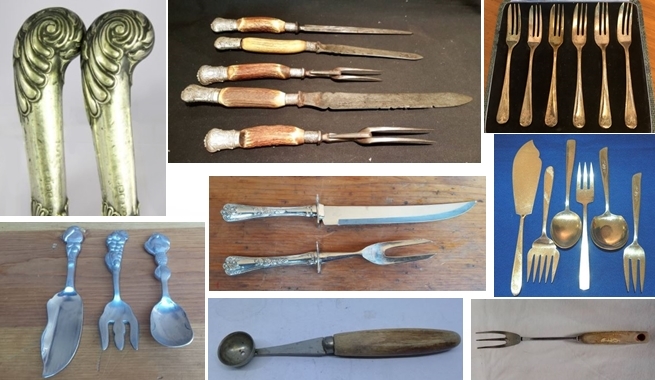 The aristocrats of the 8th century Persia (modern-day Iran), the 11th century Byzantine Empire, as well as the nobility of various European countries experimented with the whole eating-with-forks thing off and on, but it was only at the beginning of the 19th century that the fork became a staple in average households.